The Judge Rotenberg Center employs the powerful techniques of Applied Behavior Analysis, including a unique and unparalleled positive programming and reward system in treating students and clients with emotional, developmental, and behavioral issues. 1. Identify the behaviors to be changed. At JRC we analyze the student’s problems in terms of sets of behaviors that need to be increased or decreased in frequency. In the term “behaviors” we include externally-observed behaviors such as overt actions, as well as internal behaviors that are more difficult to observe, such as thoughts, feelings, emotions, and urges. If a particular student needs more than these seven standard categories, additional categories are created. And if a clinician wishes to divide one of these categories into smaller sub-categories, he or she may do this. Most of the target behaviors we initially seek to change are external, observable behaviors. However, as the external behaviors improve, internal behaviors, such as the student’s thoughts, feelings, urges, and emotions, tend to show an automatic improvement. For example, as the student begins to pass behavioral contracts, succeed in his or her academic work, etc., he or she feels better and his or her self-concept, self-esteem,and confidence improves. 2. Record and chart the frequencies of the behaviors. At JRC we record the daily frequencies of each of these major behavior categories. This recording is done around the clock, 24 hours each day, seven days a week. To accomplish this, a “Daily Recording Sheet” (see next figure) is prepared for each student. It has a separate row for each of the major categories of problem behaviors. The name, or abbreviation, of each category is listed at the left end of its row in capital letters, and to the right is a listing of the specific behaviors that will be recorded as part of this category. Each of the columns is for one hour of the day. If the student exhibits a certain targeted behavior, the staff member makes a mark in the cell that is at the intersection of the row for the behavior, and the column for the time when it occurred. The number of marks at the end of the day shows the number of times that the behavior occurred on that day. That data is then entered in a database by a member of the charting staff at JRC and software converts the data to daily, weekly, monthly, and yearly charts. See Example Charts. Correspondingly, as the recording sheet shows, instances of positive behaviors are also tracked and added to the database. The student and his or her family can easily see the progress. A sample list of behaviors, both appropriate/positive and inappropriate. This is from the daily recording packet that is used to track each student or client’s behaviors, which will be entered into the database for ongoing charting of improvement. Each list contains behaviors specific to the student or client. This system of charting makes use of the principles and procedures known as Standard Celeration Charting, which was developed by Dr. Ogden Lindsley and his students. 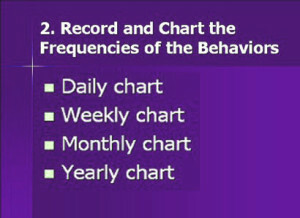 The same type of charting system is used to measure positive behaviors that the students are taught in their educational program. In some cases, the software we use has a built-in charting system. 3. Establish a powerful set of rewards that the student will want to earn. Other rewards include access to local resources such as arcades, zoos, shopping malls, YMCAs and YWCAs; and volunteer opportunities at local food pantries, pet shelters, and more; and employment at local businesses such as retail stores, grocery stores, pizza parlors, and hair salons. In each place, the student or client receives real-world, useful, training for his or her future. Here are some photos of various reward areas and activities. 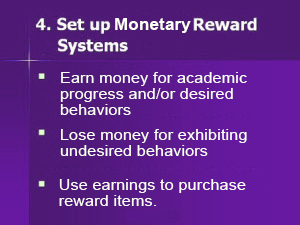 JRC uses systems in which money can be earned by the student or client via the display of target behaviors and for academic progress; this money can be spent to purchase rewards. For some developmentally delayed students, actual pennies may be used as a more tangible reward to them. 5. Using a system of behavioral contracts. Contracts are arrangements in which the student is rewarded for engaging in certain positive behaviors, or for going for a certain specified period of time without displaying certain problem behaviors. The reward to be earned at the end of the contract period is pre-specified. If, however, the student exhibits the specified problem behavior(s), the contract is “broken;” a new contract is set up and the student tries again. There are many types of contracts that are used at JRC. Normally any given student or client will be used at the same time. Short-term. These last for a few minutes – for example, two minutes – and the duration is not changed. At the end of the two minutes, if the student has not shown certain behaviors he or she earns some points or pennies. Multi-day. This type of contract might last for 1 to 7 days and would entail a major reward; longer-term contracts may also be set as indicated by the student’s progress. Special. Special contracts might be made for other special behavior issues, such as task completion, behavior on field trips, etc. Sometimes the student must pass a certain contract in order to gain access to one of the rewards areas where academic money can be spent. For example, the student might have a contract which, if it is passed successfully, allows him or her to go to the Big Reward Store, which has vending machines with healthy snacks, and various arcade games. Another rewards area where students and clients may use their academic rewards is the Contract Store. In both these areas, students and clients may use their academic money to purchase the available items. See this detailed description of various contracts. 6. Establish a “Loss-of-Privileges” (LOP) procedure. If the student displays certain major inappropriate behaviors, all opportunities to earn contract rewards or to spend earnings are suspended. At JRC we call this a “Loss of Privileges” period. The duration of the LOP can vary from minutes to several weeks. Sometimes an LOP status may be combined with shifting the student’s residence or classroom, to place him or her in a more highly staffed and less desirable residence or classroom. 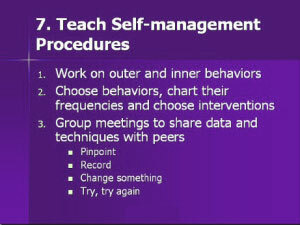 Each of the emotionally disturbed (ED) students are taught to select at least one “outer” problem behavior (such as being aggressive) and one “inner” behavior (such as having urges to be aggressive), to count and chart those behaviors, and to select and arrange their own rewards or penalties to change the frequency of the behaviors. The next figure shows the chart of a student who is counting his urges to hurt himself. The student is able to use charts in discussions with his or her treatment team, in order to get feedback on progress. Students may also meet in small groups to work on a social skills curriculum, and also to work on anger management. This chart was used by a student to track his urges to harm himself, and shows how they decreased over time thanks to his behavior-based treatment program. 8. Minimize or eliminate the use of antipsychotic medication. If a student is on antipsychotic medications when he or she enrolls at JRC, he or she may be weaned off the medications, under the guidance of a psychiatrist. The purpose of doing so is to avoid toxic, undesirable, and sometimes permanently disabling effects of medications, and to allow the student to start becoming responsible for his or her own behaviors and self-management, without feeling out of control or deadened by the drugs. Also, as medications are not able to be focused on a single, or specific, behavior, they affect the entire being of the individual; by contrast, behavioral procedures can be precisely focused on a specific behavior. In some cases, continuation or reintroduction of antipsychotic medication to an individual’s treatment program may be deemed necessary as an adjunct to JRC’s behavioral treatment program. 9. Insure that all counseling is behaviorally oriented. It is important that all aspects of the treatment program, including any counseling that is provided to the student, be fully coordinated with the rest of the JRC program, and that the counseling be conducted and offered in a behavioral manner. Traditional and Behavioral counseling is provided by clinicians with doctoral or masters level training in behavioral psychology. These clinicians are either Licensed Psychologists, Licensed Clinical Social Workers, Licensed Mental Health Counselors or Board Certified Behavior Analysts. Traditional counseling procedures often fail to successfully treat the students we serve, and in some cases may even strengthen the inappropriate behaviors are designed to treat. Behavioral counseling avoids these problems and is coordinated with the student’s ongoing behavioral treatment. However, traditional counseling is provided when it is listed in the student’s individualized education program (IEP) or when it is deemed necessary. 10. Teach the student to cope successfully with events that have historically triggered problem behaviors (“Treatment Learning Opportunities”). It is important to important to identify those stimuli and events that normally trigger the occurrence of a student’s problem behaviors. These are presented to the student on planned occasions so the student can learn how to cope with these successfully. He/she then is rewarded when he does so. Example: If a student has exhibited the behavior of pulling fire alarms at random, he is walked past fire alarm boxes. If he ignores the box and simply keeps walking, he is rewarded for the appropriate behavior. If he instead attempts to pull the alarm, he is corrected as specified in his contract. 11. 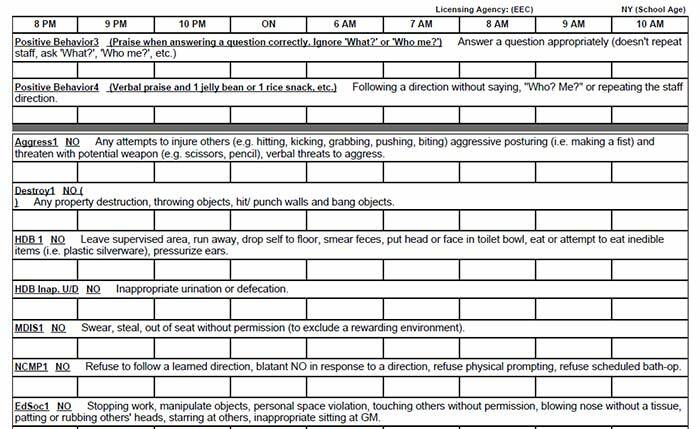 Set up Procedures to Handle Aggressive Behaviors Safely. If a student displays violent behaviors that are a danger to him or herself or to others, JRC employs emergency manual restraint in a safe and carefully supervised manner. Each student’s and client’s contract specifies the exact procedure which may be employed. 12. Changing the components of the treatment system until the charts show the desired changes in behaviors. At JRC a behaviorally-trained clinician, assisted by the student’s case manager, and with consultation from others on the student’s treatment team such as the nurse, psychiatrist, and classroom teacher, oversees the progress of each student. The clinician is responsible for reviewing the charts on a regular basis, meeting with the student regularly, entering progress notes and writing progress reports, and making changes in all interventions until the treatment program is working with sufficient effectiveness. At JRC the philosophy is that the student or client is never “wrong.” If the student is not engaging in positive, constructive, prosocial behavior, what is wrong is simply the current set of interventions – they need to be changed until they work more effectively. The clinician who supervises the treatment team is held responsible for making the needed changes. Each week one of the clinicians presents the charts of his or her students at a “data sharing” session attended by all of the other clinicians, case managers, other administrators, and the executive director. JRC’s charting software makes it possible to display all of the important charts of each student on one screen at the same time in “thumbnail” views. This type of display enables all behaviors being treated to be reviewed quickly and to enables relationships among them to be seen easily. The group makes suggestions for improving the treatment and becomes immediately aware of any case where a student is not progressing satisfactorily. In effect, through these sessions, the group holds the clinician responsible for producing progress in all of the students under his or her care. The same educational and treatment systems are in effect in the residences, in the classrooms, during transportation, and during field trips. In addition, the same carefully trained and monitored staff members work in the residences, in the classrooms, during transportation, and on field trips. These steps insure as much consistency in carrying out the treatment and educational programs as is humanly possible. The success JRC has seen in students’ and clients’ abilities to live to their own best capabilities proves the efficacy of the program.